This morning I downloaded and installed the trial version of Affinity Designer and decided to have a go at producing something straight off. I would have put my name in the PDF as author. I asked about adding my name in as author some time ago regarding Affinity Publisher and was informed how to do it and I did it successfully. But I have forgotten how and although I have searched for the thread for a while this morning I have been unable to find it. I was wondering what to draw and then I had an idea. There is a thread that I started. So I decided to use one of the palettes that can be found by following links in the thread (one link for the palette files, one link for their descriptions) and be inspired by the name of the palette and the Pantone colour of the year that is included in it. I added the palette that I chose for this learning experience and then used it. I noticed the Vector Brush Tool and just selected a colour and drew. I am using a laptop and although there is a panel for pointer movement on the laptop itself I (thus far) always use an external mouse unit. If you need to find any post you've been active on previously you can go to your Profile and click on 'See my activity'. From here you can scroll back through any posts or comments that you've made and revisit these threads. I hope this helps! The file seems rather big and then I remembered that with Affinity Publisher a big PDF was produced but when I changed it to a PDF for web, it was much smaller. So I have just tried making a PDF for web version of this, starting from the .afdesign file. However, it is still the same size. I am wondering why that is the case as the picture is only a few vector lines, a few wobbles in them but not that many points. PDFs made with PagePlus X7 with quite large subsets of fonts in them are often much smaller. However, As far as I can tell at present, Affinity Designer does not seem to have that facility available. So, is it that a PDF produced using Affinity Designer cannot have an Author field correctly filled-in in the PDF Propertied panel as displayed by Adobe Reader? When I tried to visit the BeCyPDFMetaEdit page recently it seemed to have disappeared. I wondered if that was merely temporary, but I’ve just tried again and it’s still inaccessible. I tried opening a copy of the PDF in Affinity Publisher and adding the Author information using that and then exporting as a PDF. It seems to work well, yet still large, yet 8 kilobytes smaller. 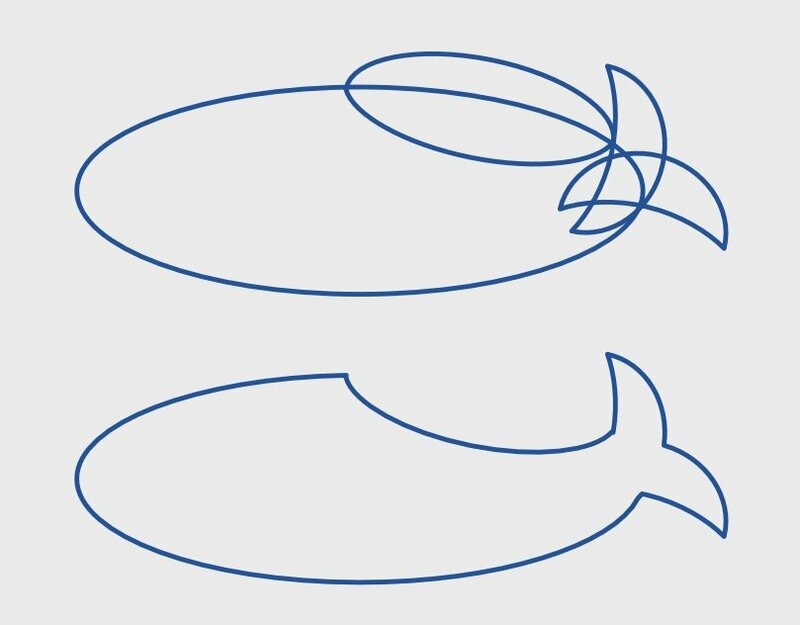 One thing I noticed was that when in Affinity Publisher I clicked on the outline of the whale, it was rather wide and I wondered if the large file is because I used a brush. I tried to produce a roughly similar drawing using the pencil tool and exported that as a PDF for web and it is under 5 kilobytes. I had tried using the Pen tool but could not get that to work, but then I have not read about how to use it, so I just left it for now as I was at the time trying to look at the issue of file size. One thing I did think about was whether I could convert the original drawing produced using a brush into a pencil drawing, using some technique. Is that possible please? Very probably! A brush stroke carries texture information which could add substantially to the ‘weight’ of the PDF file. Take a look at the icons in the Stroke panel. I have found the Stroke panel and I have found that there eleven items in the picture. But I cannot figure out what to do in relation to the - well I don't use that word in relation to computers - to which you referred. If you don’t use the word, how is one to know what you’re asking about? I tend to use the word logo instead. But ... I used lots of words!! Well, can I find out how to do it without me needing to use a word in a way with which I do not agree and will not do? If you don’t want to say “icons”, you can say “the word between ‘look at the’ and ‘in the Stroke panel’”. Since each of the icons is on a button I could equally well have said, “Take a look at the buttons in the Stroke panel”. The graphics on those buttons — graphics which I would not call “logos”! — indicate that you can choose between no stroke, a solid stroke, a dashed stroke or a brush stroke, so all you need to do is select the whale shape and change the stroke type to make it solid. This version is 4.90 kilobytes. That’s much better! When opened in AD, the whale in the first version was a ‘Curves’ object with approximately a gazillion nodes. In the new version it’s a relatively simple closed curve, although it would be a great deal smoother if drawn with the Pen Tool to create six or seven nodes instead of more than thirty. If you don’t feel confident about drawing with the Pen Tool, try adding and subtracting shapes (e.g. drawn with the Crescent Tool) to approximate the desired end result, and then use the Node Tool to refine the new shape. Did readers notice that the colour used for the two long broadly horizontal lines near the lower edge of the picture is called Living Coral? How does the charging (of money) for Affinity Designer work please? For example if someone buys (a licence for) Affinity Designer now, and those changes to PDF export in a future edition take place, is that another fee for the future edition or is there an upgrade price or is it an update that is free to existing licence holders or free updates for a year or what please? Just as with Serif’s ‘Plus’ software products, updates (i.e. point releases) for the Affinity apps are free to existing users, so you only need to pay again if you want the new features when the next full version eventually arrives. I have now produced an "about" publication for the picture, using Affinity Publisher. Both the picture and the document are now featured in my webspace, at the lower end of the following web page.